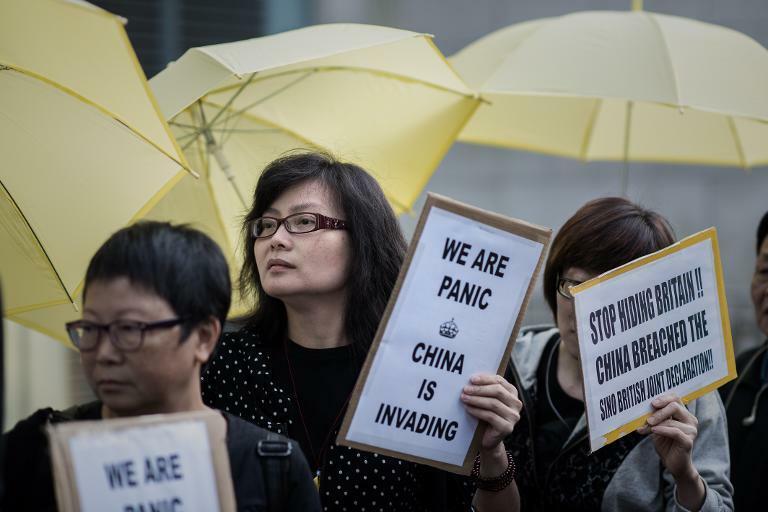 Hong Kong (AFP) - Dozens of protesters gathered outside Hong Kong's British consulate Friday, accusing the former colonial power of failing to pressure China to grant free elections in the city and protect freedoms guaranteed in a joint treaty. The demonstration comes after the last UK governor of the territory Chris Patten urged Britain to emulate the United States in offering more strident support to democracy protests that erupted nearly two months ago. Up to 100 people assembled outside the embassy, some waving the yellow umbrellas that have become the symbol of pro-democracy occupations that have paralysed parts of the city. "The UK is obligated to solve the problem... Britain bears half of the responsibility as it signed the joint declaration," 21-year-old student organiser Daniel Ma told reporters. 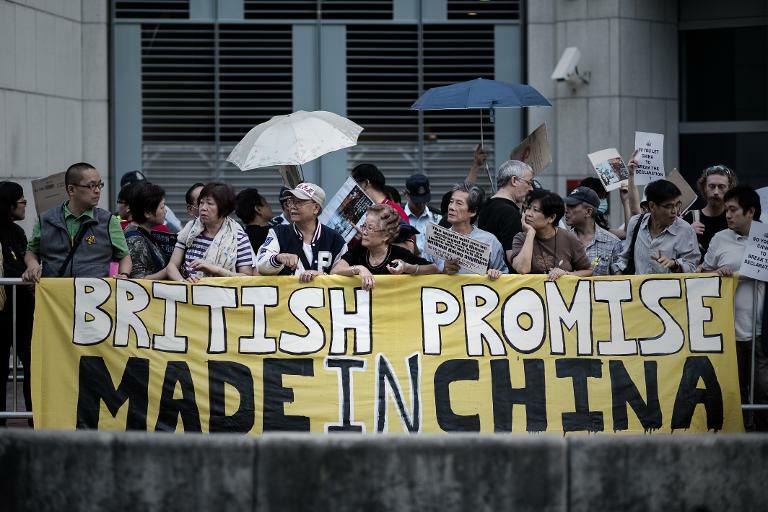 Britain and China are signatories of the 1984 Sino-British Joint Declaration, an agreement that enshrines rights and freedoms unavailable on the mainland. It also asserts that "the current social and economic systems in Hong Kong will remain unchanged" for the 50 years following the 1997 handover. The announcement was the spark for the occupations, which have seen support wane in recent days due to an attempted break-in at parliament and frustrations over traffic disruption and sporadic street clashes. "Democracy should be based on Hongkongers' will," Ma said. "It was a promise that for 50 years we have would have a high level of autonomy." "The UK cannot stay silent. If you are silent you are part of the same evil," he added. After handing over a petition to consulate officials, Ma said the group would camp outside until Britain officially condemns China for breaching the declaration. The group also wants to meet a delegation of British MPs when they visit Hong Kong in the coming weeks. 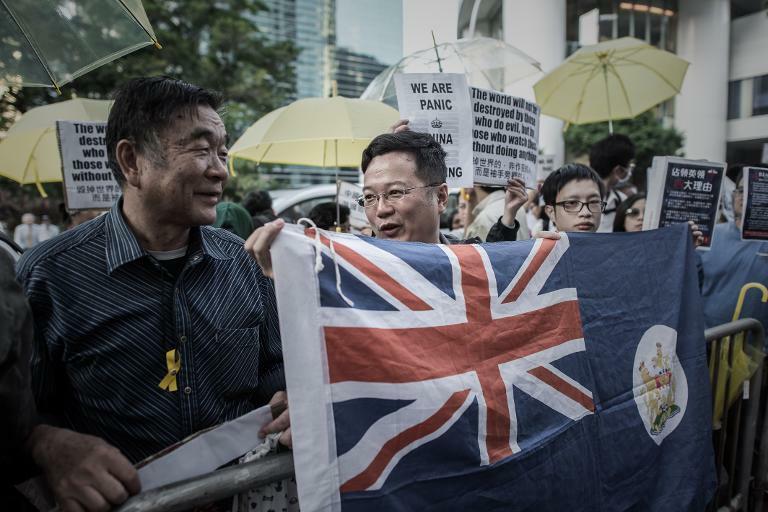 Hong Kong's last governor Patten on Thursday told a US Congressional advisory committee that Britain had been "restrained" in commenting during the weeks of protests. "I hope British ministers will note what the American government has said about Hong Kong," he said, adding the student-led occupations had been an "exemplary example of how to demonstrate for principles." British Prime Minister David Cameron has said he is "deeply concerned" about tensions in the city after police used tear gas on protesters at the end of September. By contrast, President Barack Obama said the United States would "encourage people's right to express themselves". Hong Kong residents enjoy rights not seen on the mainland, including freedom of expression and assembly. A spokeswoman for the British Consulate told AFP the British government "strongly denied" accusations it had ignored breaches of the treaty. "We consider that the rights and freedoms enshrined in the Joint Declaration and Basic Law continue to be upheld, and that it is these rights and freedoms that underpin Hong Kongâs success," she said in a statement. "Our commitment to ensuring the faithful implementation of the Joint Declaration is as strong as ever."